Ankara has spoken with Russia to probe a reported Syrian air strike that killed four Turkish soldiers on Nov. 24, the first anniversary of Turkey’s downing of a Russian jet along the border with Syria. According to a report covered by Kayhan newspaper, Turkish President Tayyip Erdogan and his Russian counterpart Vladimir Putin discussed the conflict in Syria and attacks on Turkish troops there in a phone call on Friday, sources in Erdogan’s office said. 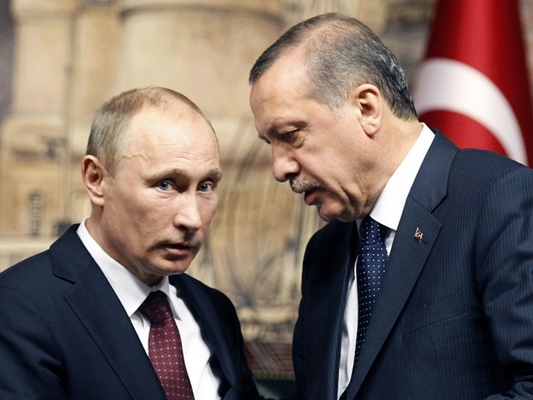 Erdogan told Putin that Turkey respected Syria’s territorial integrity and that an incursion launched in August to drive ISIS militants from the border is evidence of Ankara’s determination in fighting militant groups, Reuters reported. While the attack on Turkish forces prompted initial suspicions of an attempt to bring Turkey and Russia face to face again in Syria, one year after the jet incident that severely harmed the relations between the two, Russia adopted a cooperative attitude and assured Turkey via communication channels established as part of recent rapprochement initiatives that the strike was not carried out by them. When Turkish authorities argued that the base from which the jet took off from in Aleppo was under Russian control, Moscow said they would further probe the incident before again contacting Turkey to notify them that the attack was conducted by a Syrian Albatros plane.